Judy S. DeLoache is a leading expert on children’s behavior, and is renowned for developing the dual representation theory of symbolic development. 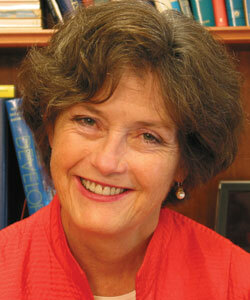 Her work has greatly advanced the understanding of children’s memory and reasoning. In an early research program, DeLoache developed a paradigm in which she hid an object in a scale model of a larger room to see if children could use what they knew about the hiding event in the model to find a larger version of the object hidden in the comparable place in the room. She observed that children two and a half years old unexpectedly failed this task and concluded that the problem was not a failure of memory, but of symbolic understanding. This work led to her seminal 1987 paper on children’s symbolic functioning published in Science. In yet another groundbreaking paper published in Psychological Science, she provided an important theoretical test of her dual representation theory. In the paper, she told very young children that she had a shrinking machine that could make a large room contract into a scale model of the room. Convinced that the small model was a shrunken version of the larger room, children two and a half years old succeeded in the hide-and-seek task. This famous article was selected by the Society for Research in Child Development as one of twenty studies that fascinated child psychology. In another high-profile study, DeLoache found that infants learned no more words from a best-selling line of DVDs for babies than did a control group. She’s also studied other child development areas, including perception of photographs and learning from picture books. And perhaps most famously, her observation that children sometimes attempt to sit in the small furniture in her scale models led to another publication in Science, in 2004, documenting the existence of very young children’s scale errors. DeLoache’s willingness to explore new research topics coupled with her keen sense of observation is visible in all of her work, and explains why she has been so prolific in various areas of research, including eyewitness testimony and humans’ common fear of snakes. Her impact on the field of developmental psychology will last beyond the scope of her career, and will continue to influence researchers young and old for years to come. Just wanted to comment that your work is greatly appreciated by those of us who teach early childhood development; the clear explanations bring the theory to life especially for our associate level students.